Does the Japanese Ministry of Education have a secret plot to turn young Japanese children into hordes of super-hero clones that mindlessly following commands from power hungry commanders? It seems so. 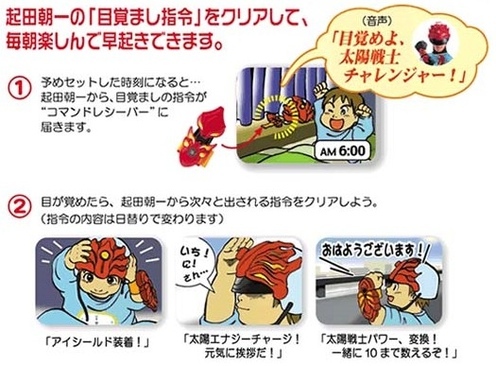 Japanese toy company People has partnered with the Japanese Ministry to create a new alarm clock aimed at kodomo-tachi. It’s called, Okiro! Asa Ichiban Taiyou Senshi – Charenjaa Kitto (Wake up! First Sun Warror of the Morning – Challenger Kit). 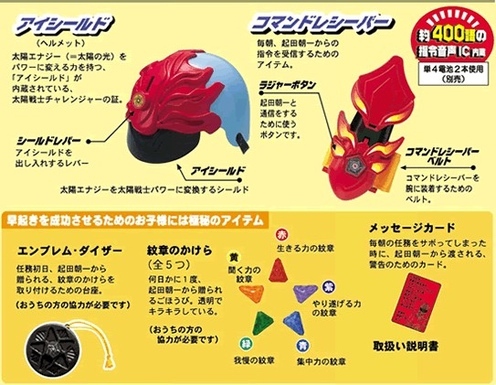 The kit comes with an eye shield, helmet, mission cards, magic amulet, and a 27 day commander program. When the alarm wakes the child up at 6am, it tells the child to put the helmet on, and push the “Roger” button. It then tells the child to count to ten in five different languages, then the child is ready to start the day. With a company who’s name is People, it shouldn’t be hard to imagine the people controlling desire that motivates their toy creations. International monitoring should be well underway to prevent the child revolution. Via Gizmodo.